Picture - confident, black cat at feet alludes to magic as her servant. She is mature and composed, focused. There is gentleness and strength in her face. Her staff reflects her strength and the flower in her hand reflects her beauty and affinity for life and nature. 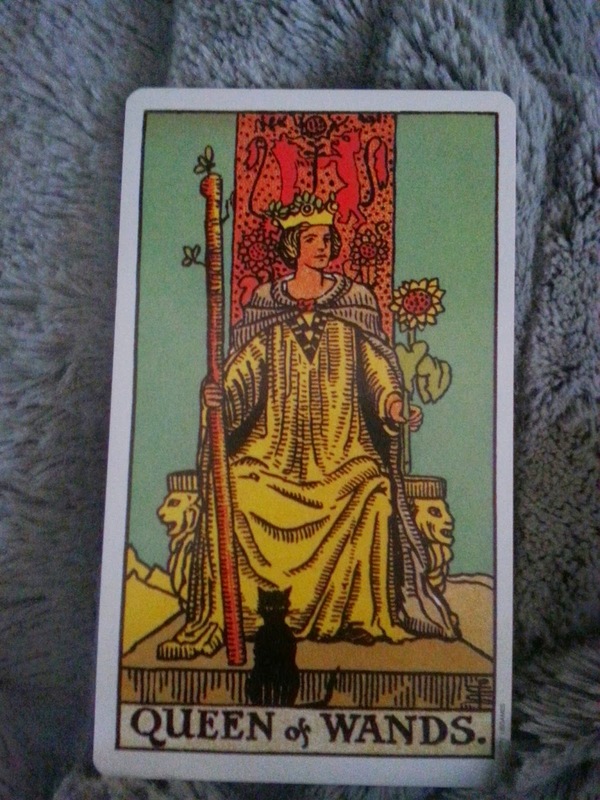 Divinatory meaning - The Queen of Wands is mature and confident, strong and focused. She carries the beauty and gentleness of femininity with gentleness and strength. She gets things done and is a force to be reckoned with. In all that she accomplishes, she is a woman through and through. She is creative in her undertakings and the end result is nurturing and benefit for those under her care. There is magic and mystery in her energy, and her energy is effective.